Reference No: 1655, inside case back stamped "1655" and "II.72"
Bracelet/Strap: Stainless steel Rolex Oyster bracelet stamped "580" and "78360" to the end links, max length 195mm. Clasp/Buckle: Stainless steel Rolex deployant clasp stamped "T4" and "78360"
One of the most recognizable Rolex models, ref. 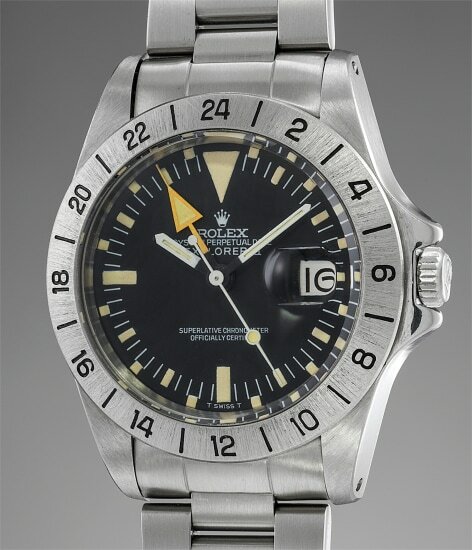 1655 was launched in 1971 and remained in production until 1985. It was an eminently professional timepiece, created to suit the needs of speleologists: the abundance of luminous details is ideal for the very low light condition of a cave, and the bright orange 24-hour hand was added to help explorers keep track of the day/night cycle when spending extended amount of time in a sunless environment. The bezel as well presents an evolution, with 4 production versions and one service version. The present specimen mounts a Mark III bezel, also absolutely fitting for the serial number and furthermore fully matching the overall excellent condition of the case. Offered complete of its original Guarantee dated 1978 (thus denoting that the present model made in 1972 took 6 years to find an owner, a very common situation for models dedicated to a restricted group of professionals such as speleologists) the present piece impresses with the astounding condition of both case and dial which classify it without the doubt as one of the most attractive examples to grace an auction room in recent times.